Whether you are trying to get in shape, learn a new skill, or simply take more time for yourself, settings goals for yourself can be a worthwhile pursuit. 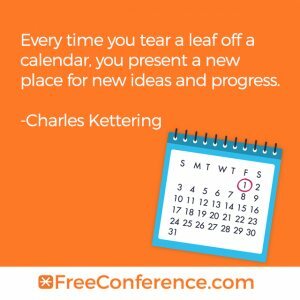 At FreeConference.com, we’re also slowly working towards the goals that we’ve set for 2017. As always, our number one goal is customer support. This year, we plan to improve our response times across the board, and make sure that customers are getting the help they need as quickly as possible. -And that’s just the ‘tip of the iceberg!’ There’s lots more slated for 2017, and we can’t wait to show off all of the new things that we have planned. Until then, Happy New Year, and thanks for choosing FreeConference.com!